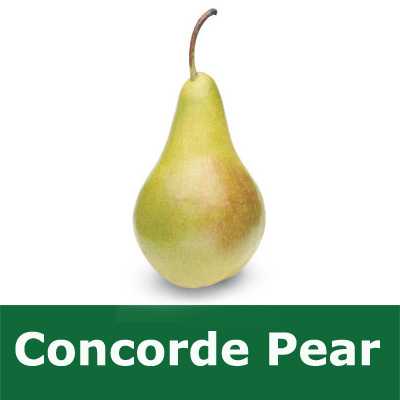 Concorde pear trees are one of our better sellers as they have several qualities that are worth while having. The large crop of sweet and soft fruit are of a higher quality and will store well. The supple side shoots are excellent for training into different shapes but if you have a small garden then the naturally compact shape will not be too invasive. The fruits are considered medium to large. It is also a pear tree that will attract the birds and other pollinating insects so be prepared to have a busy garden around flowering time. Another great advantage to the Concorde pear tree is that is has good resistance to mildew and scab. This is not to say that you could put the Concorde pear tree in a mildew and scab research laboratory without a protection suit and expect it to go home uninfected. As with most things, this is all relative. Compared to many other pear trees, the Concorde does not suffer as much with mildew and scab. The Concorde pear tree has also been given the Royal Horticultural Society award of Garden Merit. We are not sure if the RHS is as "allegedly" corrupt as FIFA and the MP's expenses office so take this information at face value.